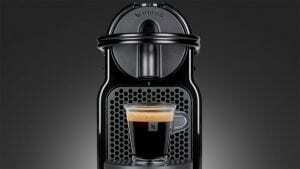 If you are looking for a good espresso machine, you know that you should look wherever Nespresso machines are. When it comes to getting the best quality espresso machines – it is the brand for you. In order to help you out when you are making your decision, we’ve written a Nespresso Inissia review. This one will give you all the information you might need about this incredibly compact machine. After all, if you have a small kitchen or bar, this is the best home espresso machine for you. As we said at the beginning of our Nespresso Inissia review, this machine is amazingly compact. In addition to this, it weighs only 2.4 kg. However, don’t let the size fool you. This machine has everything it needs to and it makes sure that you get a fresh tasting coffee. Additionally, this machine is highly functional and easy to use, making it perfect for beginners. Although some people have claimed that the Inissia is an entry-level model, be rest assured that it has features you wouldn’t expect to have in it. If you are somewhat picky regarding the coffee types, you can upgrade with the Inissia bundle pack. If you get this expansion, you will have a greater repertoire of drinks. Instead of choosing between espresso and lungo, with the Aeroccino3 you will have the chance of drinking milky drinks. So, cappuccinos and lattes will be also what you can offer your friends or family who are coming over. From the first glance of this espresso machine, there are a few things that you can notice. For instance, it is very compact. This makes it fit perfectly in different types of kitchen styles and environments. It doesn’t take up space either, and it doesn’t look bulky. Regardless of how small your kitchen is, it can never be too small for this Nespresso machine. Color-wise, it comes in a great variety of colors and you can choose one that fits your aesthetic needs. If chosen properly, you can make it fit without noticing it there – it becomes a part of the interior design. Also, it adds a touch of sophistication since it has some parts that are metal and thus, shiny. Although the Inissia is only 12 inches wide, it still has a lot of things to offer to you, a regular coffee lover. So, it would probably surprise you that it has an amazing water tank. The water tank has a capacity of 700 ml, which makes it a lot better than other similarly priced machines. Additionally, the tank is closed with a nice lid, which prevents leaks. It also prevents making a mess in your kitchen every now and then. Regarding the maintenance, it is safe to say that this machine is one of the easiest ones to clean. It doesn’t require a lot of cleaning and when it does, it is very easy. Moreover, the Inissia comes with a perforated removable drip tray. This drip tray is above an internal bin for the pods used, so, you won’t have to clean the pods each time you make a cup of coffee. As we said before in our Nespresso Inissia review, this machine is very easy to use. It has a very helpful instruction booklet which doesn’t require a lot of reading. It is very user-friendly which is why most of us love it. Although you might be a bit confused at the beginning, once you master the technique, you will see that you can easily get a fresh cup of joe in just a few seconds. And, it will have the rich taste you long for. We hope that our Espresso Inissia review has helped you make the decision for your next purchase. This machine is simply a good buy – from functionality to practicality and budget-friendliness. It has it all, and you will surely end up completely satisfied.